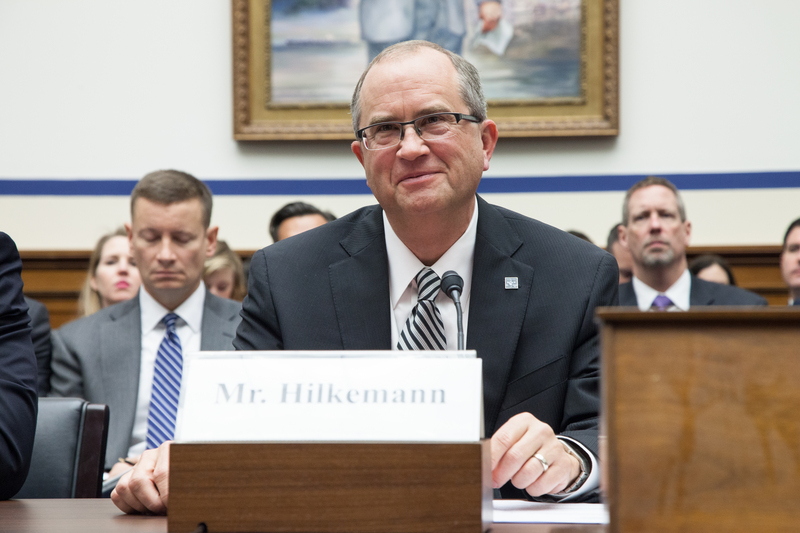 View a video of Aaron Hilkemann’s testimony. Chairman Shuster, Ranking Member DeFazio, Aviation Subcommittee Chairman LoBiondo, Aviation Subcommittee Ranking Member Larsen, and distinguished members of the Committee: My name is Aaron Hilkemann, and I’d like to thank you for the invitation to testify before the House Transportation and Infrastructure Committee. As the President and Chief Executive Officer of Duncan Aviation, I appreciate the opportunity to discuss our company’s business and our vital work with the Federal Aviation Administration (FAA) Flight Standards Division, as well as other portions of the agency. By way of background, Duncan Aviation is located in Lincoln, Nebraska. We are the largest family-owned Maintenance, Repair & Overhaul (MRO) organization in the world, providing complete acquisition sales and support services for business aircraft. The Duncan family has owned and operated the business since our founding in 1956, and we provide service and support for nearly every major make and model of business jet aircraft in operation today. Duncan Aviation has more than 2,000 hard-working aviation maintenance and engineering team members, including more than 500 veterans, in locations throughout the United States. We have major service centers in Lincoln, Nebraska, Battle Creek, Michigan, and Provo, Utah, and operate 18 smaller, satellite avionics facilities at the highest-volume business aviation airports across the United States. Duncan Aviation is also a member company of the General Aviation Manufacturers Association (GAMA) and I currently serve as Vice Chairman of that organization’s Board of Directors. I also serve as Chair of GAMA’s Airworthiness and Maintenance Policy Committee, which represents manufacturer and repair station organizations on issues affecting continued airworthiness and maintenance of general aviation products. Our company is also a member of the National Air Transportation Association (NATA), the National Business Aviation Association (NBAA), the Aircraft Electronics Association (AEA), the Professional Aviation Maintenance Association (PAMA), the National Aircraft Resale Association (NARA) and the Aeronautical Repair Station Association (ARSA). We regularly engage with the FAA, TSA, European Aviation Safety Agency (EASA), and International Civil Aviation Organization (ICAO) to ensure appropriate regulations and policies for aircraft maintenance, repair stations, and the overall safety of aviation. Today, I would like to discuss some of the issues that affect FAA regulation and oversight and the resulting impact on our repair station business. At the same time, I’d like to highlight other topical areas that impact our ability as a company to provide services and remain competitive in the broader global marketplace. Before I speak to those examples, let me provide some information on the influence that MROs have on the aviation marketplace. MROs are the primary maintenance providers for aircraft of all makes, models, and sizes. This includes regular maintenance, repairs, overhauls, and upgrades/retrofits that are necessary to improve the safety, efficiency, and reliability of aircraft and air travel. Duncan Aviation is a prominent player in the business aviation segment of the marketplace, which includes all business jets manufactured by Bombardier, Embraer, Dassault Aviation, Gulfstream, and Textron. We are an FAA-certificated part 145 repair station and hold an FAA aircraft certification Organization Designation Authorization (ODA). Our ODA pertains to Supplemental Type Certificates (STCs) for interior modifications and avionics system installations and upgrades, Major Repair and Alterations (MRA), and Parts Manufacturing Approval (PMA). According to the Aeronautical Repair Station Association’s Global MRO Market Economic Assessment of January 2014, prepared by Team SAI consulting services, U.S. FAA certificated repair stations employ 195,114 people and generate $21.3 billion in U.S. economic activity . Duncan Aviation competes in the global market and is certificated by 21 international authorities as a repair station. Approximately 25 percent of our revenue is derived from aircraft that are registered internationally and based outside the United States. Our activities as a repair station are governed by the FAA’s Flight Standards Service, so this is where most of our experience lies. As many of you know, the FAA’s Flight Standards organization has very broad responsibility, including certification and oversight of pilots, mechanics, air carriers, airlines, and repair stations, as well as all general aviation aircraft operations and maintenance. As a repair station, Duncan Aviation works extensively with our local Flight Standards District Office, or FSDO, in Lincoln, Nebraska. As an ODA, we also work with Aircraft Certification Offices (ACOs), Manufacturing Inspection District Offices (MIDOs), and Aircraft Evaluation Groups (AEGs). We sincerely value our relationship with the FAA and we recognize and commend the agency for its dedication to aviation safety. However, successful organizations must always strive for continuous improvement. In that light, as the 114th Congress prepares to reauthorize the laws governing the FAA, I’d like to share some thoughts regarding ways to improve the effectiveness and efficiency of FAA regulations and oversight. First, it is important to underscore the work that Congress already started in the last authorization to address one of the leading systemic issues with flight standards affecting the industry, and to update you on where we are today. The FAA Modernization and Reform Act of 2012 included Section 313, a provision designed to improve the consistency of regulatory interpretation, enhance communications between the FAA Flight Standards and Aircraft Certification offices and industry, and promote better and more timely regulatory decision making. The Act required the FAA to establish an advisory panel to review and address findings of an October 2010 report by the Government Accountability Office that cited inconsistent interpretation and application of regulations as one of the leading systemic issues affecting repair stations, air carriers, and manufacturers. In July of 2013, the FAA submitted a report to Congress with the recommendations of this advisory panel. I’d like to highlight two recommendations that are of particular interest to Duncan Aviation and MROs generally. The primary recommendation was for FAA Aviation Flight Standards (AFS) and FAA Aircraft Certification Service (AIR) to consolidate the service organization-level regulatory and guidance libraries into a single Aviation Safety (AVS) master electronic database resource to allow the agency and industry access to relevant rules and documentation. Further, the FAA should conduct a review of all regulatory, guidance, policy, and interpretation documents to identify potential conflicts, cancel outdated material, and ensure proper cross-reference with applicable regulations. This ensures that FAA inspectors and industry representatives have access to the regulations and all relevant interpretative material and acceptable methods of compliance to support consistent interpretation and application. The establishment of the RCCB will help promote constructive dialogue between the FAA and applicants for the resolution of potentially adverse issues in an expeditious and fair manner. Without the advisory panel in place to expedite a decision, individual inspectors will continue to apply inconsistent safety measures and enforcement actions. As the Committee can see, the thrust of Section 313 was to ensure that regulations are applied equitably and consistently by different regional offices of the FAA. If implemented, when questions arose regarding concerns of isolated compliance methods or interpretations, there would be an established process to provide guidance utilizing past or existing examples. Although progress has been made in some areas, the challenges of inconsistent interpretation and application of the rules, and the lack of an efficient system to prevent these issues, continue to hamper U.S. businesses. To date, the FAA has been considering the recommendations of the Section 313 advisory panel and determining the feasibility of implementation within current resource and budget constraints. Although some initiatives are already underway, significant progress in putting into place the consolidated centralized library or establishing the RCCB advisory panel has not been made. The FAA’s inconsistent application of policy can have a profound impact on companies like ours. The MRO marketplace is extremely competitive due to the fact that it is global in nature. Therefore, Duncan Aviation has to continuously evolve to address advancements in technologies and customers’ expectations. Inconsistencies and the ability of the FAA to provide interpretation and application of requirements in this dynamic environment have a direct impact on our business. Our ability to implement improvements, expansions, or changes that affect our competitiveness is reliant on this process. For example, Duncan Aviation has been working with the FAA for more than two years to address an issue that resulted from the reinterpretation of an FAA position on acceptable means of compliance for mobile maintenance units. While the regulations were clearly intended to support this type of operation, recent FAA Orders have provided inconsistent messages to the FAA field personnel working to authorize, support, and oversee this ongoing activity. Across the U.S., different FAA inspectors utilize a variety of methods to authorize this activity, and varying methods to oversee this activity, and in some cases, choose to prohibit this activity—all based on guidance material in the FAA Orders that either conflicts with other material or with the regulation itself. This is an example of an issue that affects the broader repair station community. To be fair, the FAA managing policy office has been very responsive to our concerns and is actively working to address these issues. Guidance is expected to be published in 2015 that will help to clarify the proper control processes of a mobile maintenance unit. Duncan Aviation is grateful for the support and applauds the FAA for its efforts. I raise this issue simply to highlight an example of when inconsistent interpretation and application create an uncertainty that could have been corrected through the aforementioned recommendations. Repair providers experience challenges when attempting to discuss compliance methods with the FAA, especially when there are inconsistencies in regulatory interpretations among FAA inspectors or offices. When a company raises concerns about differing or new interpretations of regulations, inspectors can be reluctant to discuss these, leaving industry with a lack of clarity as they choose a compliance method. Once a compliance method is chosen, sometimes the FAA safety inspectors will issue a “Letter of Investigation” (LOI) or even levy fines rather than offer the chance for an explanation or the opportunity to escalate it to an FAA Regional Managing Office. This puts industry in an untenable position. Once the enforcement has been initiated, it removes the option to address the issues directly with the local office involved and it removes any authority of the regional or Washington, DC office, since it is now a legal enforcement action. This process completely circumvents the FAA’s safety mission and the objectives of the compliance and enforcement program, which is to promote consistent compliance with statutory and regulatory requirements. Instead, this practice is more aligned with a lack of due process and the encouragement of sanctions. It also wastes resources, as an issue that could have been resolved through dialog becomes a protracted, expensive, and counterproductive distraction from meeting our mutual safety goals. Over the last decade, the aviation industry has experienced a shift in the way maintenance organizations operate. As a result, there has been an increase in the number of audits that are conducted on MROs by regulatory agencies, air carriers, and the repair facilities. These frequent and redundant surveillance activities, many of which are conducted by foreign aviation authorities, duplicate similar efforts while producing little additional value; they do not increase the level of safety. Simply stated, the current system is not efficient, and we need to move to a more risk-based approach to system safety. The FAA is in agreement with these concerns and recently presented a paper to ICAO on “Assuring Compliance with International Oversight Obligations without Duplication; Shared Surveillance of Approved Maintenance Organizations.” In it, they suggest that in order to improve the efficiency and effectiveness of surveillance activities, aviation authorities should consider ways to consolidate and enhance auditing programs at the national, regional, and international level. Duncan Aviation supports these initiatives and, in consultation with other stakeholders, has offered to provide the FAA with information that identifies areas where improvements can be made. This is an initiative that will require broader strategic planning, and we ask that the FAA continue to provide international leadership in establishing the recognition and acceptance of FAA-certificated repair stations. I urge the Committee to support the FAA and ensure the FAA can continue these initiatives because our competitiveness in the global environment requires that the FAA continue to provide global leadership. I hope my testimony underscores why today’s hearing on FAA oversight is merited. We believe the upcoming FAA reauthorization offers the FAA, policymakers, and industry the ability to constructively and collaboratively address some of these concerns and ensure a robust system that promotes safety and more effective and efficient oversight. Chairman Shuster, Ranking Member DeFazio, Aviation Subcommittee Chairman LoBiondo, and Aviation Subcommittee Ranking Member Larsen: On behalf of Duncan Aviation, thank you for your leadership and the opportunity to provide this perspective on the FAA’s Flight Standards activities. I would be glad to answer any questions that you may have.